Closing in | arlette knits. One reversible brioche stitch hat: finished. Check it! The decreases turned out exactly as I’d hoped. 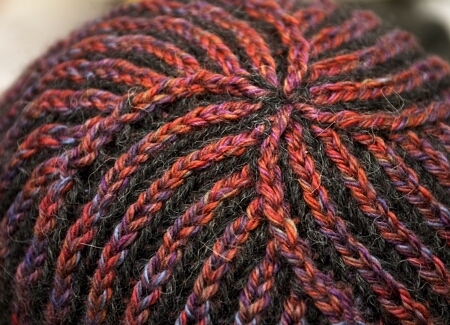 I also like that the hat construction has a pleasing symmetry to it: the hat is 64 stitches around, there are 32 rounds before the decreases, and the decreases are worked four times per round over four stitches. It’s also reversible, meaning it has two sides. It’s nerdy, but damn I love powers of two! The hat itself is super easy to make, once you get used to the whole brioche thing. The decreases take a bit of concentration at first, because each decrease has to be set up on the previous round to get that nice, neat spiral, but they’re not so bad. I managed to get through the whole hat without consulting my notes, so it’s pretty easy. I took copious notes while making this, so I think there’s a real possibility that I could write a legible pattern for this.